“A brown parcel that arrived by interlink was waiting for me when I got back to the office. It had the Regton label on it. It was wrapped in brown kraft paper so well that it felt a shame to open it. It was evident that care had been lavished on the packing not like a box stuffed in another box without a thought and a shipping label slapped on it that is commonplace these days. The Garrett Clearsound Easy Stow Headphones with an inline volume switch which consists of Dual volume controls for adjusting signal levels to suit individual hearing requirements along with speakers that have a Frequency response of 30-18,000 Hz which is suitable for all hearing ranges. A supplementary instruction sheet expertly written by Nigel Ingram the Managing Director. It contained tips on how to get the best out of the Garrett ace series. A plastic zip tie bag containing a pocket size Garrett Ace 400i owner’s manual, Garrett control box cover to protect the control box from rain, dust, mud and a smaller zip tie bag containing 2 rubber washers, coil bolt and wing nut. A shaft, Garrett Ace PRO Performance 8.5″ x 11” DD coil, fastened securely by a re-lockable cable tie (saves getting the cutters out), a snap on coil cover, and of course the brains of the unit- the Ace 400i control box, with 4 x Duracell AA Batteries already assembled, and at the end of the ‘S’ shaft, an adjustable arm cuff with the Velcro strap already fitted. The coil cover is easy to fit, just align the coil cover the correct way to the coil and then snap fit all the way round. The coil can be fitted to the straight shaft by fitting the rubber mounting washers, place the shaft into the coil and then insert the bolt then tighten with the wing nut. Fitting the s shaft to the straight shaft is a piece of cake, firstly by unscrewing the cam lock and then inserting the shaft at the same time squeezing the stainless steel spring clip buttons until they pop out of the holes and then tighten the cam lock. Do the same on the straight shaft and set to the desired length, and fasten the cam lock by twisting it. Wrap the coil cable around the stem leaving a little slack at the bottom of the coil or use insulated tape to keep it at the optimum length and then wrap the coil cable several times round the shaft and then align the plug with the control box socket and then twist the nut to tighten. The Ace 400i is now ready to be used. The Garrett Ace 400i has 5 different functions. 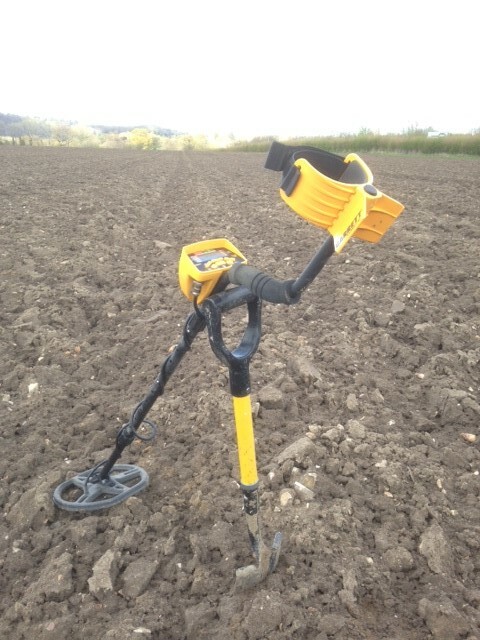 I recommend setting it up using the Custom settings as the Ace 400i metal detector retains your settings and is perfectly universal. To do this select the custom mode. Remove the single left hand cursor and insert the missing cursor so that the range is from 40 to 90. The custom mode is the same as the coins mode, and to change to the values displayed, use the DISCRIM and accept/reject buttons to insert the value blocks. The modes I use most is Zero Discrimination (All metal) and custom as both modes cover my needs and these values are what I used during this review. It has a unique Iron Audio feature which allows the user to hear discriminated iron. I turned on the Ace 400i and then away I went- no fiddly complicated settings which would suit a newcomer who wanted a high spec 10Khz machine with a frequency range to provide better sensitivity to low and medium conductivity targets, such as gold and lead. The machine is very well balanced and light to use, with a very clear accurate VDI display that shows the metal setting at every target, unlike some metal detectors that give an Audio signal but no VDI display value but requires the target to be nearer the coil before you know what the target values may be. The Frequency select is a handy add on, just in case you encounter another metal detector within range or EMI interference. Pressing the Discrimination + button and the tick/X button simultaneously changes the detectors frequency. The audio sound is loud but non-adjustable there is no volume control, it is controlled by the Clearsound inline control or any headphones with adjustable volume control. 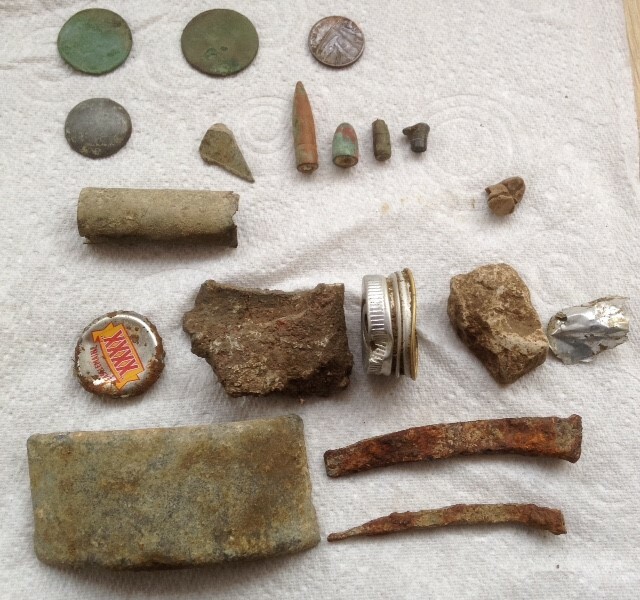 On one of the digs I went on I had a good clear signal and a stable reading on the VDI and dug up a little lump at five inches which at first looked like some lead. 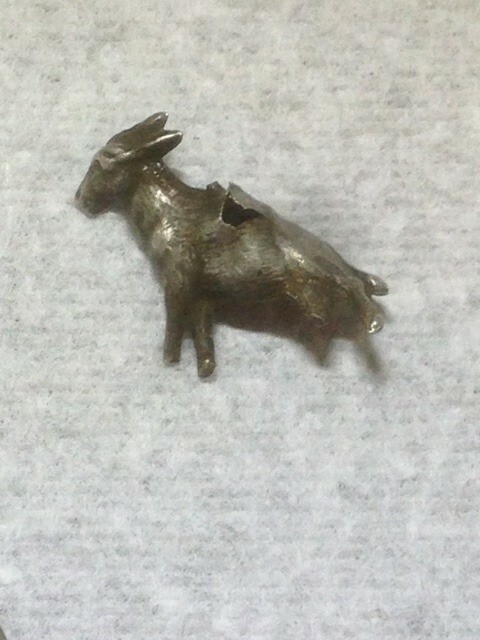 On closer inspection it was a very small silver bracelet charm which turned out to be a Donkey- I was well pleased with this find. I have yet to encounter any falsing, and if that happens and the handbook explains just reduce the sensitivity down a notch or two to eliminate it. Positive signals can be confirmed by comparing one signal and then turning 90 degrees. Diggable signals can be confirmed by using the iron Audio mode which will give you a spitting signal if it encounters iron. My real world tests are below. 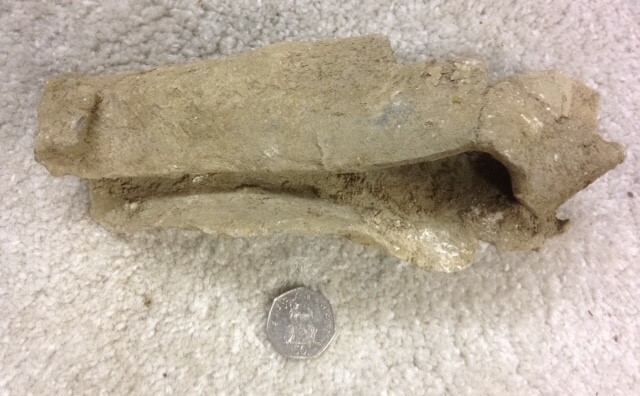 Personally I was very impressed with it, as it has produced one of my highest finds rate that I can remember. These are the targets I found. In one of the clods I thought I had a large hammered and was quite excited about it. However it turned out to be a Bull/Cow ID tag. However I found a silver donkey which was part of a charm bracelet. How it got in the middle of the field is beyond me. Firstly the freshly ploughed land was a nightmare to walk on- Each had been ploughed to a height of over 12 inches and was hard going, then afterwards to some pasture and the weather was fair/sunny at times and also a little chilly. 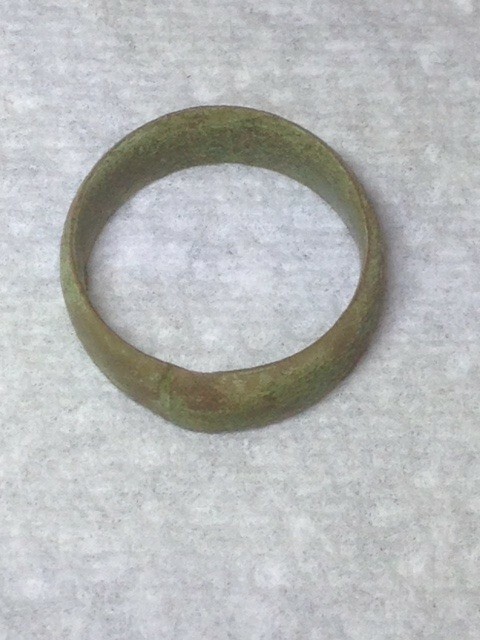 Had a real sense of excitement where I dug up a clod of earth and found a ring of gold that was visible. Carefully peeling away the mud revealed the actual item, a screw bottle top. Oh well, the feeling was good while it lasted. Found four bullets- two complete and undamaged and two that had hit some kind of target. Each one identified by the markings around the base. An 1891 Victorian penny, A blank coin of some description and a 2011 one pence piece coming up as iron. The rest of the items were experimental digs to try out the capabilities of the Ace 400i. Had a signal and digging down to around 24” found the biggest piece of lead I have ever dug up and it weighs 3.58Kg. It was not bad despite other club members had not found much. Went out again with the Garret Ace 400i. Was on top of a hill and the wind was cold at 08.30 am but the sun was shining and the views were spectacular and not far from me were 5 Leverets and it was a delight watching them play together. 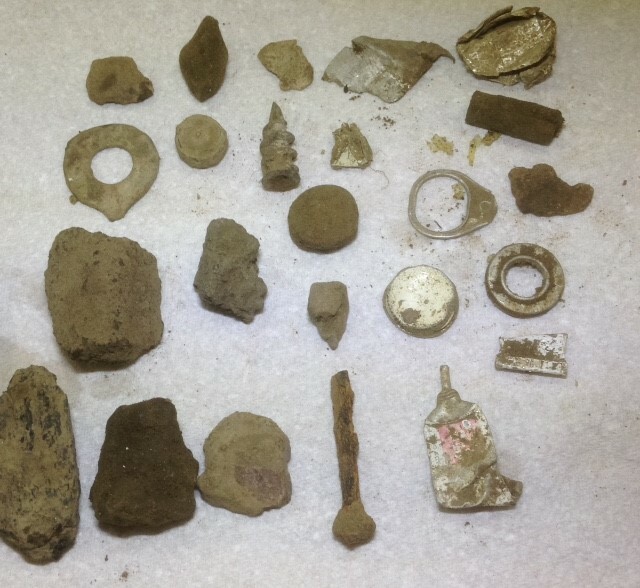 The ground was baked hard and very flinty and finds were difficult to extract. The result of the day is below. It was a coke free site and was a delight to detect on. 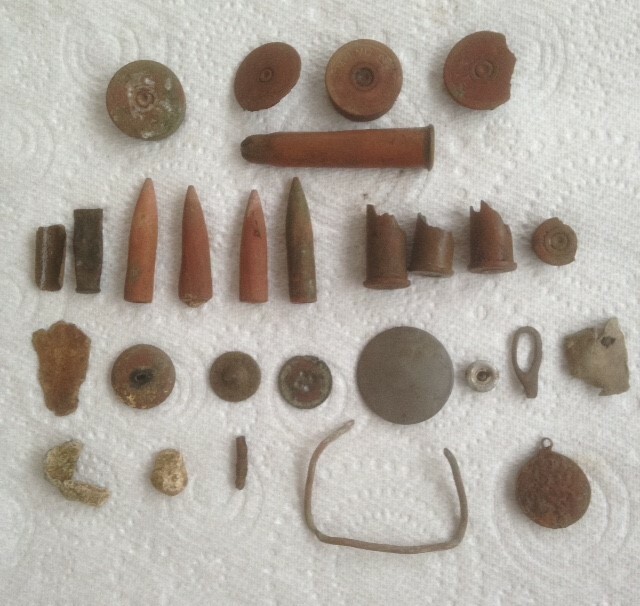 Found some bullets and even a live blank. A pendant was found and it is gold/coperish in colour but it has a lot of crud on it and is difficult to remove. 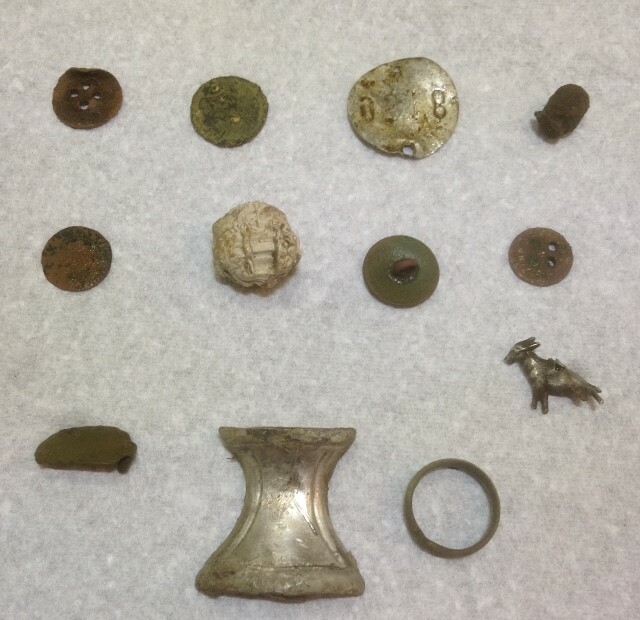 Plenty of buttons especially a large pewter one and some small items. I was very happy with the Garret Ace 400i performance as ground conditions allowed me to have it on maximum sensitivity and it did not false once, and due to the Iron Audio tone I dug less iron than before. 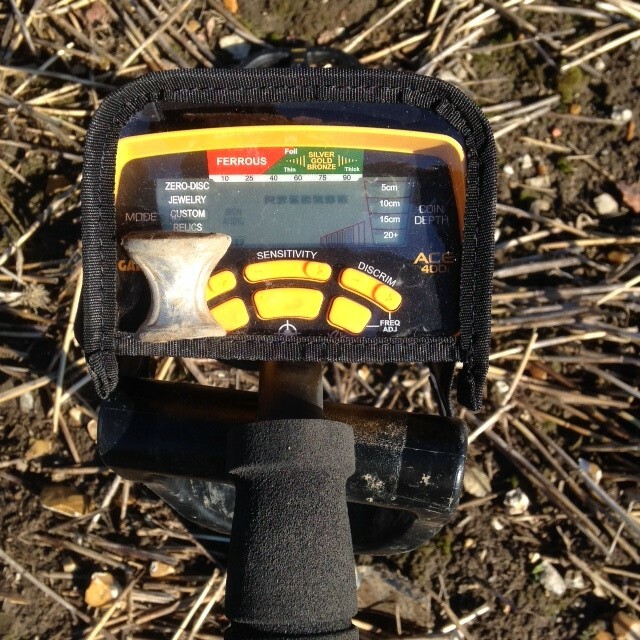 Overall the Garrett Ace 400i is a great all-rounder finding very small and large items of various descriptions, I have been out for approx 23 hours and it has a battery life of 3 bars remaining and not once have I found the detector heavy. 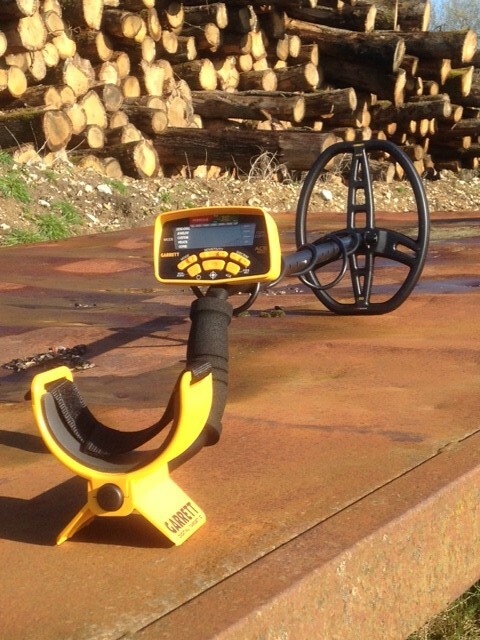 It is an easy to set up and go, well balanced machine and has been a pleasure to use. The big clear VDI display is readable, clear and identifies metals well. The iron Audio feature has helped identify iron, allowing me to walk on. With a different larger coil I believe this could be a deep seeking exciting machine. Really interesting, thank you. How do you think it is better than the Euro Ace 250 which I currently use? How does the 400i perform in heavy mineralised soils? Does this international version offer ground balance? 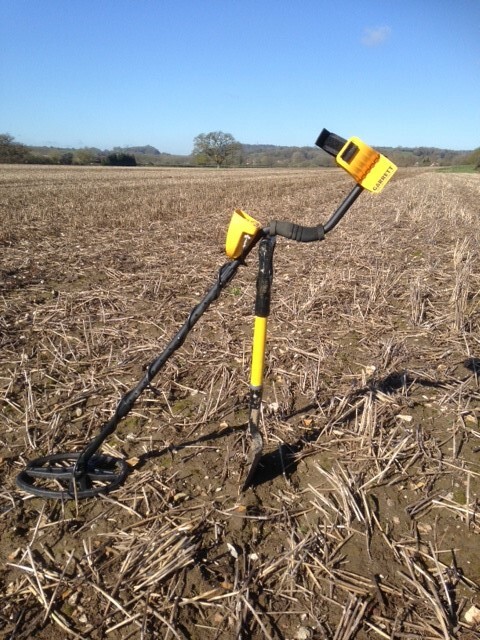 Is it a better machine for these types of soils than the Fisher f5 or F44? A very well written piece. You mention about using a larger coil. Could you make any recommendations for a coil you might use with the 400i? Nel Tornado 12″ x 13″.